Units currently contain one GC001 Battery Clamps w/ Integrated Eyelets. Additional Battery Clamps and Eyelets available for purchase below in the related product section. The G-750 Smart Charger by Noco is a 750 mA battery charger designed to charge and maintain small batteries. This is a perfect charger for motorcycles, ATVs, snowmobiles, jet skis, and any other power sport vehicle. Noco uses true switch mode technology in this super efficient line of chargers. This charger has a noise factor of 150 mV, less than 50 db. This charger is a true multistage, microprocessor controlled charger that will not overcharge your batteries ever. Also incorporated in this unit is the ability to adjust to low voltage input, which could happen if running it off of a generator or a very long extension chord. This charger can operate off of as low as 85 VAC and all the way up to 130 VAC and will withstand voltage surges up to 200 VAC. One of the most unique features about this charger is that it is capable of charging both 6 and 12 volt batteries. It also is capable of bringing a dead 12 volt battery back from as low as 2 volts. 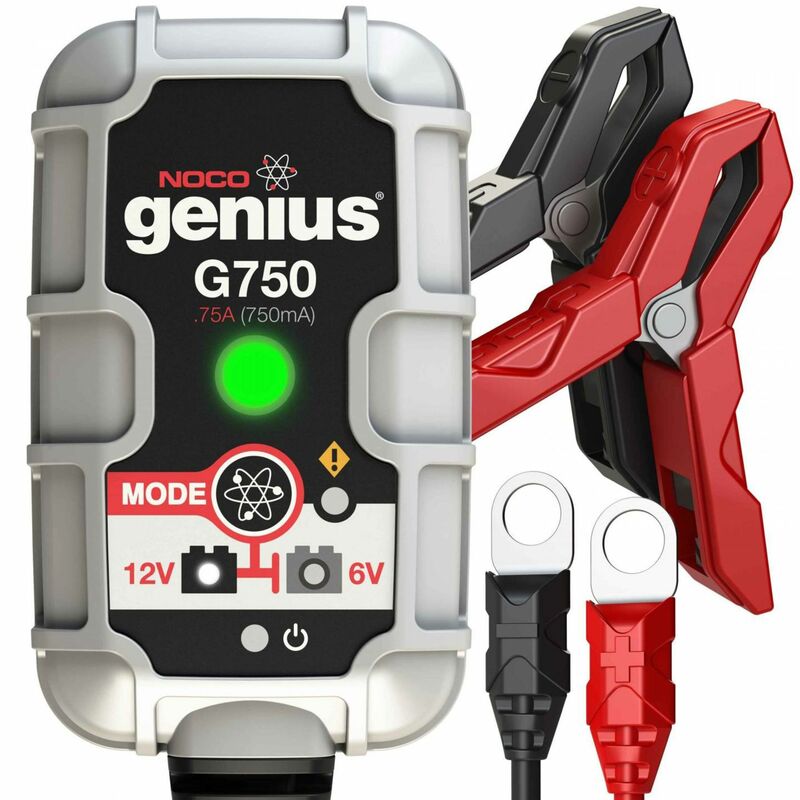 The G750 is best for small battery applications from 1.2–30 Ah. Do you own the G-750? Please, tell us what you think about it. It helps us provide you with better products. Please note that it may take up to 72 hours for your review to appear. Pros: A charger that does two voltages 6v and 12v, choice of connections, small size and readable directions makes this product a winner. Cons: No handle. This would be a great addition for tight places, which we have. Pros: Seems reliable, charges extremely discharged batts back to life when possible. Cons: Doesn't get the 6V's up quite as high at full charge as my other chargers - avg volts run 6.4 @ full/maintenance charge. Pros: My Ford 9N tractor has a disconnected generator so I need to charge the battery after use. The tractor is primarily used for gravel road maintenance and snow removal. The Genius has been a great investment for maintaining this 6 Volt system. I might see a few additional years before the need to replace the battery. Cons: It creates more Radio Frequency Interference than you can shake a filter at. Totally made one radio in the 150MHz range unusable. The only time I can charge the battery is when that radio is turned off. I use a lot of battery chargers (4-wheelers, jet skis, etc.) mostly Battery Tender's, but I've tried a couple of NOCO's. I've had 2 NOCO's with issues : After starting they will go into an error mode with flashing lights and then stop charging. This one was doing that and then died. Not that I've never had a problem with a Battery Tender, but I've got a lot more of them! Just got this unit from Battery Stuff (love the fast delivery) and it seems to be well made and is doing the job on a motorcycle battery. It is annoying however that it DOES NOT include an SAE adapter (like what is on all my motorcycles) in the box. So I have to buy one for an extra $10. This should be stated clearly up front in the product listing.